A pride of the tourism entities of Cuba is the Playa Pesquero Hotel, located 10 miles away from the famous Guardalavaca Beach and 33 miles away from the city of Holguin , which international airport, Calixto Garcia, receives flights from many countries of the globe. Inaugurated on January 21, 2003 by Cuban president Fidel Castro, Playa Pesquero Hotel has come to be the largest hotel of the country and its additional facilities are devoted to satisfy the most demanding tastes. This pride of Cuban tourism was constructed in 24 months. 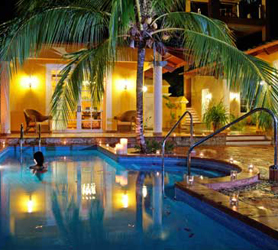 It has a five-star category and it is operated with the All Inclusive system. Its 944 rooms, all located in comfortable and separated bungalows, are spread in an area of 29.4 hectares and it is an outstanding fact that there was a total protection of the environment as well as the flora and fauna, which posed a challenge to the constructors that had to work in a landscape of natural beauties almost at the edge of the unconceivable. Holguin , with an area of about 3 500 sq mi, is one of the 14 Cuban provinces. Its population is over the million inhabitants and the territory has become one of the most important tourist poles. 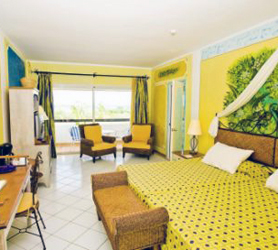 About 73 percent of the hotel facilities of the province are categorized in four or five stars. Heading its hotel industry, we find the Playa Pesquero Hotel. Barely 30 days after its opening, had this colossus of tourism in the island already surpassed the figure of a thousand guest every 24 hours. The successful takeoff was the result of countless efforts, going from the architectonic conception to the excellent attention and training of the personnel offering their services in all areas of the hotel. This jewel ornaments a strip of land of Holguin ’s northern littoral. The natural beauties of that place are enjoyed by families with children, young people, matrimonies, incentive groups, and other tourist segments. The railroad topic, fundamentally represented by a well-preserved ancient locomotive placed in front of the main entrance, is recreated in the history of Cuba as the fourth country in the world and the first one in Latin America in implementing the use of this means of transportation. It is at the same time a legend that has become a sort of a leitmotif, being in all areas of the hotel and providing it with another touch of distinction. 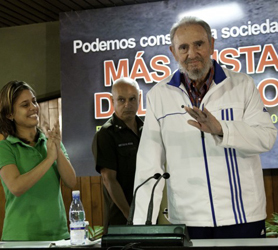 Fidel Castro, just after having cut the symbolic ribbon during the inauguration of the hotel, confirmed the decision of developing a tourism industry of health, peace, and safety on the island. The Playa Pesquero also counts on a vast gastronomical offer including an international buffet restaurant with room for 640 guests, as well as other four restaurants à la carte, which serve meals for about 500 guests a day, and two more informal ones: one by the pool area and another at the beach. A boulevard gives some extra life to the swimming pool during the evening with a commercial gallery, Cuban clubs, and social activities as well as ice cream and beer cafeterias with their own ambiances. This new facility has all the resources for an agreeable stay, as well as highly professional services represented by the endless and kind smile of its workers.